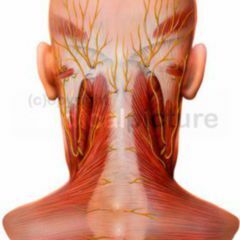 Neck muscles in the narrow sense, or ventral neck muscles, refer to the skeletal muscles which make up the anterolateral muscle mass of the neck (collum). 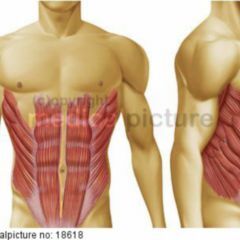 The neck musculature in a broader sense also includes the nape muscles, which is however frequently discussed as part of the back musculature. 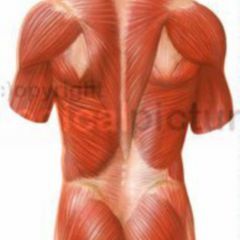 The platysma is a skin muscle and is also counted among the mimic muscles. Note: The middle layer is defined by some authors not as belonging to the ventral neck muscles, but listed as a separate muscle group. 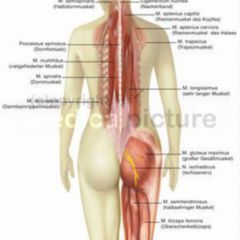 The rectus capitis lateralis and the rectus capitis anterior are assigned by some authors to the secondary back muscles or the nape musculature. 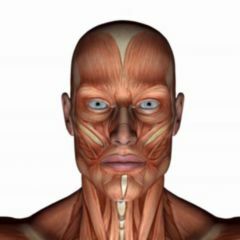 The ventral neck muscles are responsible among other things for the statics of the cervical region and the flexion and inclination of the head. In addition, these muscles serve under certain conditions as part of the respiratory musculature.